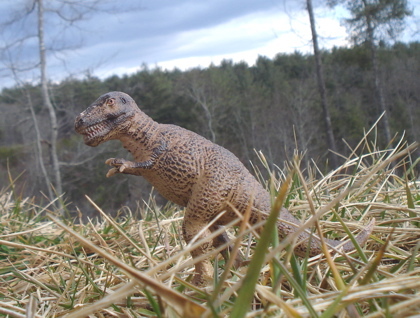 The Schleich T-Rex - King of the Dinosaur toys? 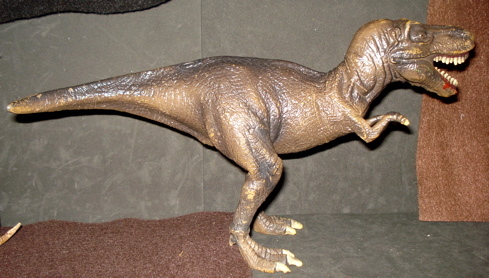 When I first took my two Schleich Tyrannosaurus out of their box (my box of Schleich figures, that is) I found that my older figure would not stand up. It kept toppling over. What was called for was plasteopedic care. 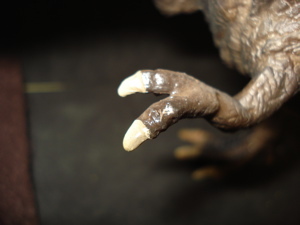 What disturbed me mostly is that the ankles of the older T-Rex are, for some reason, a lot softer and more bendable than those of my newer figure. Thus this page began in my plasteosurgery operating theater (the kitchen, to the non-cogniscentii). "You'll be alright. I... I just know it. 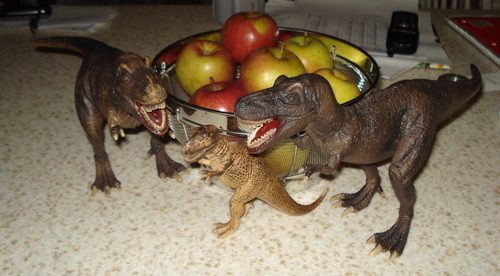 (sob sob)"
So off we go, to find out if the T-Rex did turn out to be alright. "Yes. I am going to be alright. Pull yourself together and let's get something to eat." "Hey, come back here. I need post-operative snacks." 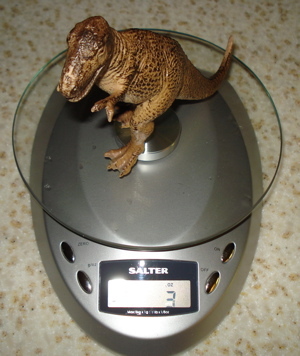 Weighing In at 12.5 ounces (356 gms) and measuring 12.5 inches (32 cms) from nose to tail tip the 2004 Schleich T-Rex scales out right at 1/40. This puts him in the same category as the Bullyland, Carnegie, and Papo Dinosaur toys. So far so good. 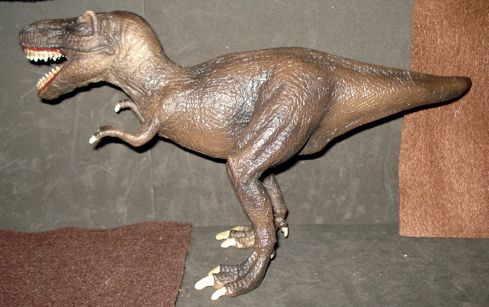 In 2002 Schleich presented a smaller (three  ounces [86 gms] and eight  inches) 1/63 scale T-Rex which will be included on this page. This smaller figure is sculpted in the currently repudiated upright, tripod (two feet and tail on ground for balance) position. It is crudely made, even for eight years ago, and I can't get up the desire or imagination to give it its own page. 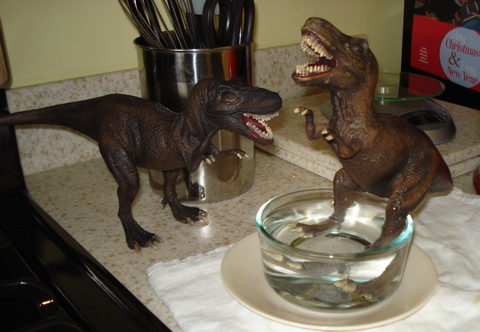 So it will serve here as a T-Rex Junior. Come along, Junior. One thing I do like about the 2004 figure, in fact the only thing, is that the tail appears to be of the correct length (although it may be a tad short). The head of this figure, however, appears way out of proportion and its very shape is that of a cinder-block. To me it looks a bit like a clown-head, with big teeth. 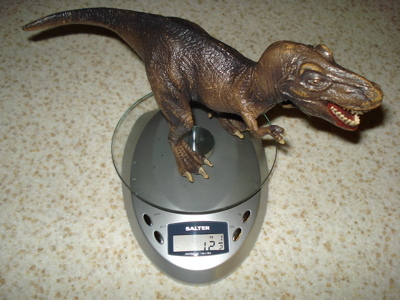 The shorter than your average Dinosaur toys tail and skinnier legs (we'll get to those) has created an interesting result. The scale is larger than you would expect and it stands quite tall at the hips, towering over equivalent scaled Tyrannosaurs such as the Bullyland and Carnegie figures (both of which I prefer). In fact, it is larger in every dimension while presuming to be of equivalent scale. 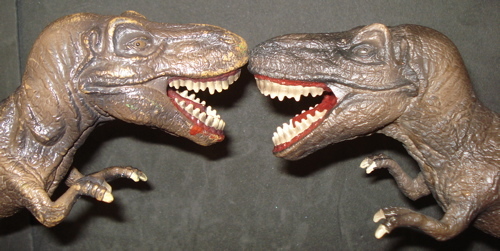 While it is a toy, it is sort of the 'Frankenstein's monster' of current T-Rex Dinosaur toys. 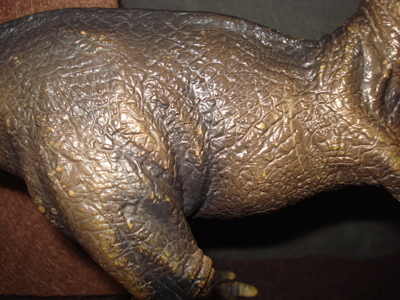 As can be readily seen (above) is that the head is blocky and boxy looking. It really doesn't look like something that might actually be based on a living creature. It is just simply oversized. 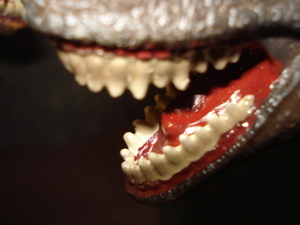 While it does look as if it were wearing lipstick (given the monochrome bright red paint used for the gums, tongue and palate) because the paint appears to have been purposely extended onto the jaws and chin (above). 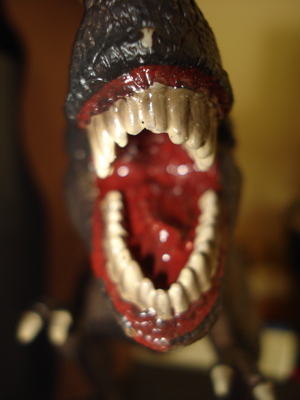 Schleich may have intended for this to be blood, dripping from the T-Rex's mouth, but it just looks like sloppy painting. Since it is on both of my figures, done in the same way at the same points, I am presuming that it is a purposeful attempt to add drama to an otherwise relatively static figure. On the other hand the large head provides the room for some pretty impressive looking teeth and quite the ferocious look as he comes at you, head on. 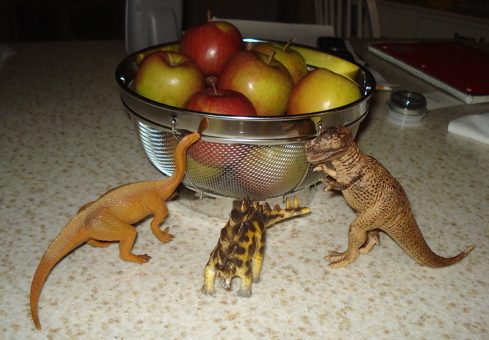 Below we see one of our T-Rex approaching a pair of Battat Triceratops. "Can you spare me a bite?" "We'd rather just stick it to you." 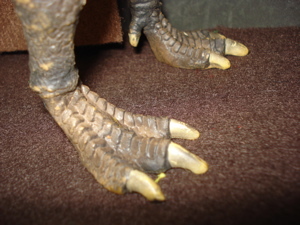 The feet and legs of the figure are placed next to each other, in parallel, with no action in their stance. 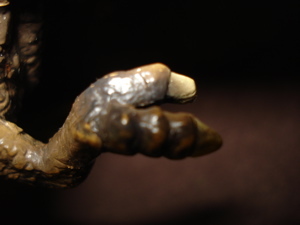 Just as the forepaws are. For me this would ordinarily be a positive, were the figure as a whole better done. One thing that is done better are the feet themselves. 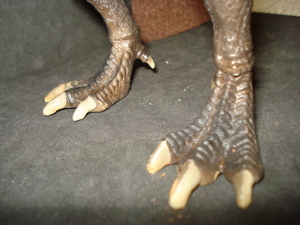 The claws are quite substantial as is the vestigial toe up on the ankle. The feet look good. "Hey! Come back here. At least slow down...puff...puff...puff." Another problem that I have with these is the quality of the paint-jobs. They seem (in addition to the previously mentioned monochrome, fire-engine-red mouth) to be relatively fragile, given that these are toys and presumably meant to be played with. 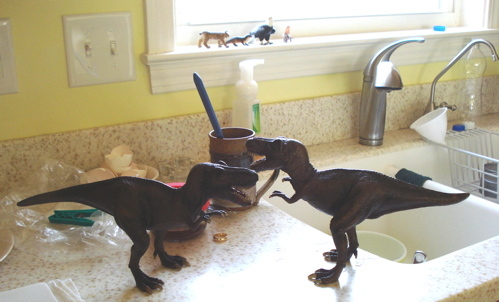 The wear on the little 2002 T-Rex is substantial and that on the older of the two larger figures is quite significant. As you can see (above) the older figure (left) is well worn, despite spending all of its time with me just in a box with other Schleich figures. The newer figure on the right shows much less wear. And shares the same quarters. But then I haven'y had it as long. 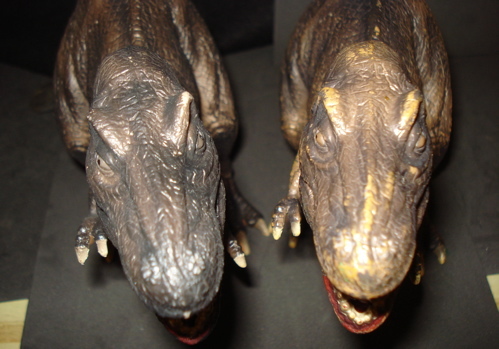 The wear is very easily seen in this comparison (above) between my newer T-Rex (left) and the older, on the right. The clouded-over look of the eyes can also be seen. 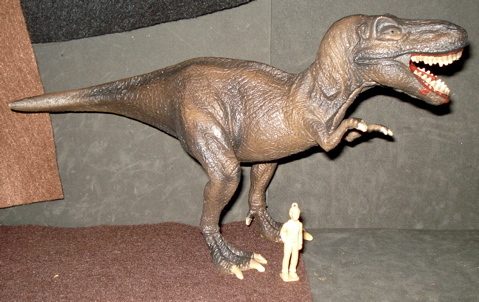 The 2004 T-Rex and the smaller 2002 are in completely different poses, and their shapes are different enough to lead one to suspect that they are meant to be models of different creatures. 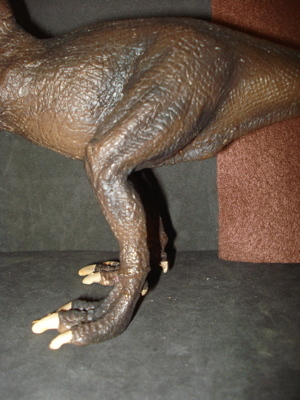 Below, the paint is completely worn off the tail tip and the head appears almost scarred on the smaller figure. 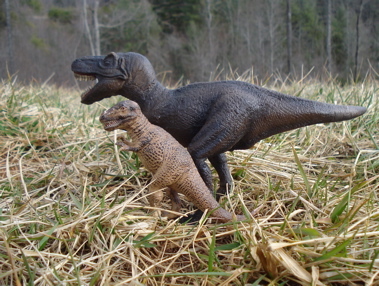 Here (left) we see our older (larger) T-Rex taking a younger (smaller) out on a hunting expedition. Soon, the little fellow has to go out on his own (below). The world seems a whole lot bigger when you're out on your own. "This hunting on your own bites." 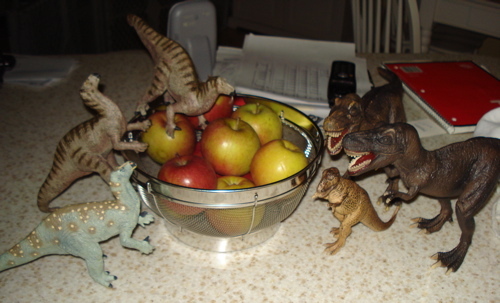 "Just move along, there's nothing to eat here." 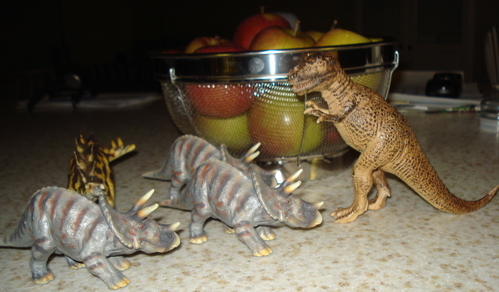 I really like the small 2002 Schleich Triceratops. It's brightly colored with a high quality, durable paint. Hunting isn't necessarily an easy lifestyle and the "ambush hunter" who hangs around the waterhole or Dino-bar, looking for the unwary prey or mis-directed date needs to learn the skills. 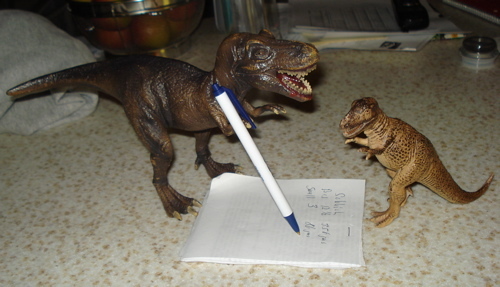 "Okay kid, start taking notes and we'll show you how it's done." 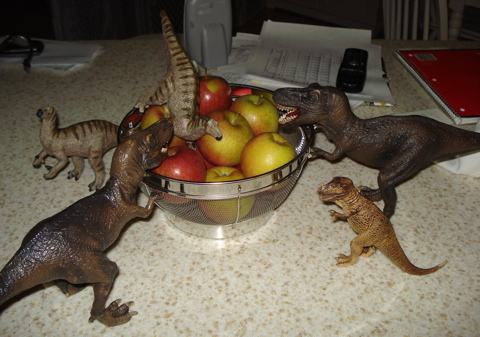 "We'll just hang around the apple-cart and someone tasty is bound to drop by." (Some visitors are a bit too large and tough.) "Hi there, big guy!" "You're mine "Apple Annie." Bwa, ha, ha!" "This one looks good kid. Now let's see how you do." "That looks tasty but not everybody wants to be eaten." "Not you again!" "We told you to buzz-off kid." 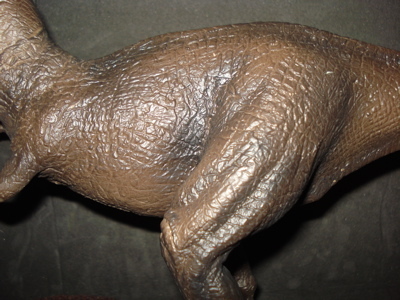 For those of you who may be concerned that injury or worse may have occurred here on the Dinosaur Toys Collectors Guide set, here is a picture from the post-shoot party. As you can see, some of the party goers required rides home. And haven't been heard from since. Uh oh. Moral? Never accept rides from hungry T-Rex and other predators! 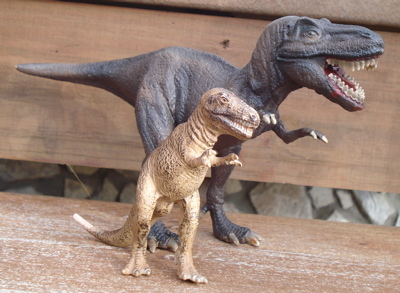 The Schleich take on the T-Rex, whether in the larger 2004 or the smaller outdated pose of the 2002, is somewhat cartoonish and (I hate this term) "unrealistic" (we really have very little idea of what these "really" looked like). Given their somber coloration and odd looks I just can't get behind them for a recommendation. On the other hand they do photograph well. They also come in a pose that I prefer in a toy. Simple, straight forward and ready and able to do whatever you imagine. But they are just plain odd. The 2004 brings to mind "Doctor Frankenstein's T-Rex" and the 2002 model something from a low-budget 1950s Dinosaur movie. I am also sorry to report that the weak ankles of my older '04 are giving out again and he is falling on his snout more and more often. I find this unexpected, unprecedented and very strange. My older one of these appears made of a slightly softer material than the other. But I have no idea about manufacturing dates and they don't provide a clue. Certainly nobody would accuse Schleich of not putting out the effort as can be seen in a cursory glance of the underbelly, the detailing on this critter goes the full 360*, which I like. But the bottoms of the feet show no effort at all, which I don't. The top-down view is quite good and shows this T-Rex off to its best advantage. For those of you who might consider this T-Rex as lunch-box fare it bears the European Union imprimatur, the now ubiquitous "CE", on its underbelly, right along with its name, manufacturer and where it is made (China). That "CE", plus the extensive new USA Conumer Product Safety regulations pretty much guarantee that these are safer (if not as tasty) to eat than a lobster purchased from that guy with a trunk full of them, on ice. Both of these are still readily available from retail outfits (and on auction sites) in 'new' condition. By which I mean new. 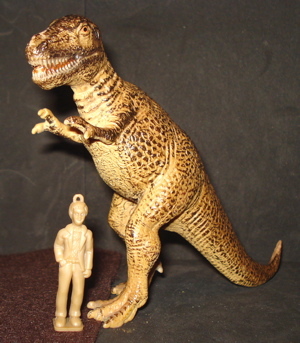 For the larger, newer 2004 Franken-Rex prices range from $13.31 to $19.99, while for the 2002 outmoded model we are looking at $1.25 to $9.79, plus shipping. There appears to be a third (new?) 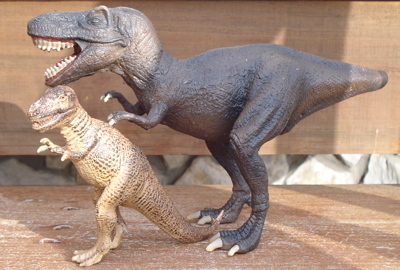 Schleich T-Rex on the market, in the now defunct upright, tripod position, with a better head than either of the figures reviewed on this page but I don't have one. If you want a review you'll have to send me one. 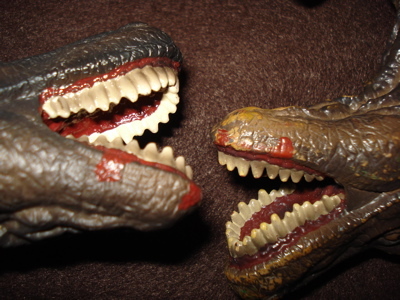 If you're a Schleich fan you probably hate me by now and think that these are the greatest things since sliced bread. If you aren't a Schleich fan I'd urge a pass unless you are also a masochist and seek disappointment in your purchases. I got these on eBay, as part of larger lots. 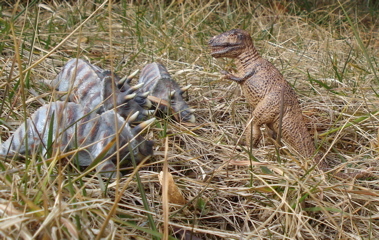 And just in case you are thinking that I have it in for Schleich for some reason check out my page on the Schleich Allosaurus, which I consider the "spider's web" and a classic Dinosaur toys figure. Get one of those instead. You won't be disappointed. Check it out. 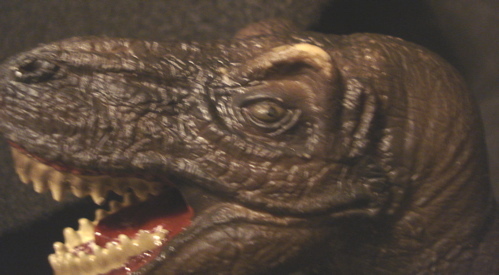 You have been reading the Schleich T-Rex page. 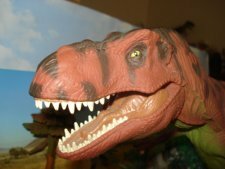 Click THIS link to return to our main Tyrannosaurus Rex page, or click here to learn how you can create a site of your own. What do you know and love? Why not share it with the world and create a lifelong income stream at the same time?